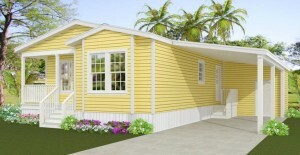 Lake Griffin Harbor – a 55+ community in Central Florida – offers an excellent selection of mobile homes for sale. At our community in Leesburg, FL, you will find lots of affordably priced pre-owned manufactured homes as well as a select number of lots on which you can build a 1,344-square-foot, three-bedroom, two-bathroom home custom-built by Jacobsen Homes. Through the provision of low-cost housing and other perks explained in more detail below, we aim to make it easy for retirees to stretch their savings to the fullest. Lake Griffin Harbor is a Blair Group-owned development that caters to the lifestyle goals of people ages 55 and older. We offer a great selection of manufactured homes, a beautiful lakeside location, and a professional onsite management team that ensures the smooth day-to-day operations of the community. Contact our Lifestyle Team today to request additional information about Lake Griffin Harbor, including a listing of mobile homes for sale that are currently available inside of our active lakefront 55+ community in Central Florida. And remember: Lake Griffin Harbor isn’t just a place to live … it’s a lifestyle.